The first part of the legendary series of platformers Mega Man was born more than thirty years ago. 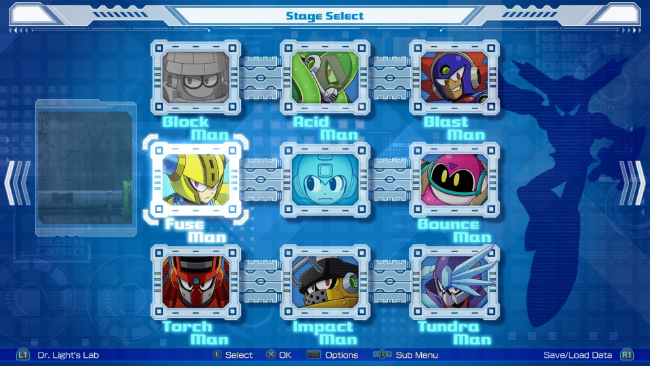 In Japan, the game was released under the name of Rockman, and according to the original concept, some heroes had to have names associated with musical genres. So, an android named Rock had a sister Roll and an older brother Blues. 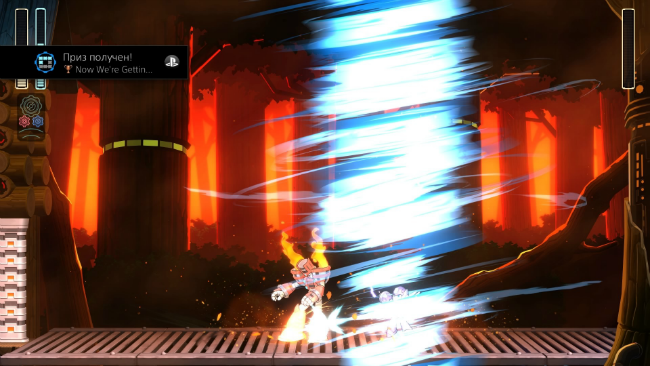 However, in Western versions, this had to be abandoned and the game renamed Mega Man. In our territories, on eight-bit platforms, the project met with both Japanese and American headings, however, we did not delve into the subtleties of the plot, but simply enjoyed the complex and exciting gameplay with jumping platforms, shooting and various abilities of the main character. The plot of Mega Man 11 continues to exploit the opposition of caricature villain Dr. Wiley with Mega Man and Dr. Light in the world of the future, in which humanity has fully mastered robotics. The story begins with the invasion of the cunning inventor to the base of the main characters. Wiley steals new robots and escapes. After a little dialogue with friends, Mega Man sets off in pursuit of the villain. The developers immediately introduce the player to the new Double Gear system. This gadget can slow down time or increase the charges of the protagonist. A separate button on the gamepad is responsible for each of the abilities, and when turned on, a special sensor appears indicating the degree of overheating. The device must be turned off before the scale is full, otherwise, the gadget will close and become unavailable for a certain time. This device becomes an indispensable assistant throughout the game. The slowdown is very effective in battles against fast opponents and helps to pass particularly difficult parts of the level. In turn, the gain opens up new possibilities for one or another weapon. 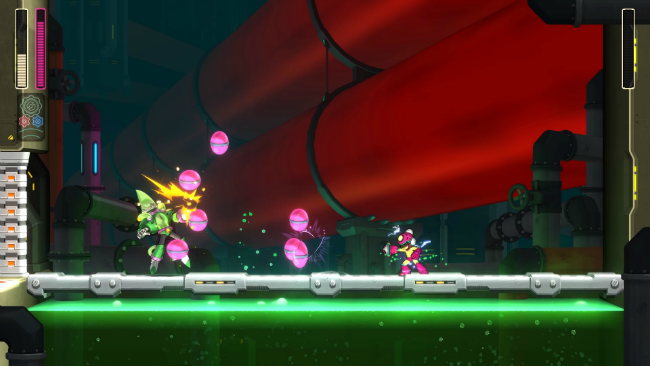 For example, the very first blaster becomes more powerful and in one shot launches two projectiles at once, which perfectly helps to deal with the enemies behind the shield. The freezing weapon in enhanced form increases the radius of the wave action to the full screen and perfectly cleans the area from a flock of small enemies. 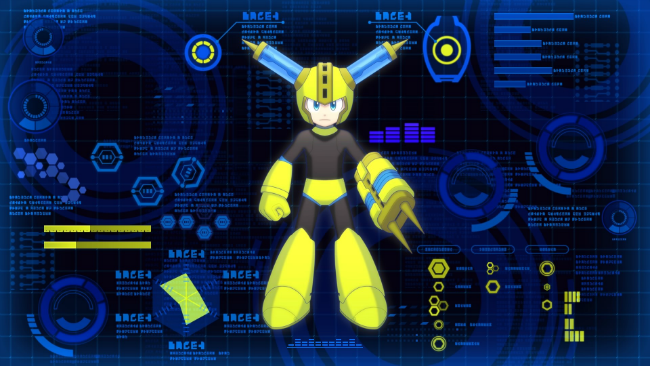 The weapon in Mega Man 11 is very different from each other not only by formal signs, like elements but also by the way of action. For example, Scramble Thunder starts an electric charge on the surface and he runs forward, repeating all the bends of the location, helping to eliminate opponents that are hidden behind obstacles. Block Dropper, on the other hand, drops a few boxes from above in the manner of an air strike from Worms, and the Pile Driver, which resembles a jackhammer, allows you to attack a nearby target with a powerful attack on the front. Developers are motivated to creatively approach the process of destroying opponents and come up with various options to achieve the same goal. The game carefully follows the formula of the series and from the very beginning opens all eight locations, allowing you to pass them in any sequence. At the levels, you are awaited by various enemies, traps and difficult tests in which you need to show dexterity and skill. The game constantly tests you for strength, offering jumps on moving platforms with shooting opponents, where you need to quickly think and act. Some levels include puzzles that are accompanied by the attack of enemies, making it difficult to focus on the task. On a normal level of difficulty, only a few lives are available for the whole level, and control points are found only in the middle and in front of the boss. Defeating the main villain of the episode, the character gets an additional weapon, and if you complete the levels in the correct sequence, each new weapon will be effective against the boss of the next level, which makes your life much easier. In some cases, simple logic will help you understand the sequence. For example, if the boss throws fire, then it means that he is weak against freezing. Accordingly, in front of him you need to go to the leader with the right weapon – and so on in a circle. Therefore, the tactics of the passage of the story campaign lie in finding the weakest boss for you at the very beginning of the game. Mega Man 11 is the game in which the first watch can be the hardest, but then you can pump your character and get used to the design features. As a result, even more, complex episodes with time will seem easier than those that were at the very beginning. The locations will meet bolts of different sizes, which serve as the local currency. Before another attempt to conquer one level or another, you can go to Dr. Light’s laboratory and purchase additional lives, batteries to replenish the health scale and weapon charges, as well as devices to reduce returns, increase the number of bolts dropped from enemies and much more. The range of devices is quite wide and is designed to make your life easier, but it is not necessary to use them. If you can’t get through the winter level for a long time due to slippage on the ice, you can buy special studded boots. In addition, the sale has a gadget that allows you to automatically charge a shot from the main blaster without pressing the button. The main character is accompanied everywhere by a robot dog named Rush, which, at the command of the player, turns into a springboard, and after passing through four levels, he is able to turn into a kind of air skateboard. It can fly over the abyss and other obstacles. Abilities of the dog will be primarily useful for obtaining additional bonus items, and only at the end of the game, there are areas in which his skills are required. The game has four levels of difficulty. In addition to the normal mode, there is a complicated “Superheroic” and a simplified “Casual”. They differ in the strength of their enemies and the number of save points. If you can’t play at all, you can always put a low complexity: there are more checkpoints on it, and useful items often fall out of enemies. At the same time, the simplifications are not so strong that the game turns into an easy walk. 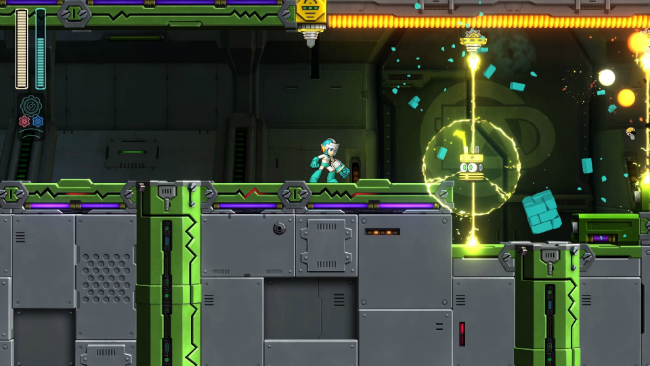 Even in the “Casual” mode, Mega Man 11 makes you tense up, make quick decisions, study locations and opponents. Additionally, the game has Challenge Mode with various tests. In addition to the standard time races or points, there are unusual tasks, such as those where you need to get to the boss, make as few jumps as possible, or complete a level by collecting as many blue balls as possible but avoiding the red ones. After passing the story, this mode is able to captivate the player for a few more hours. 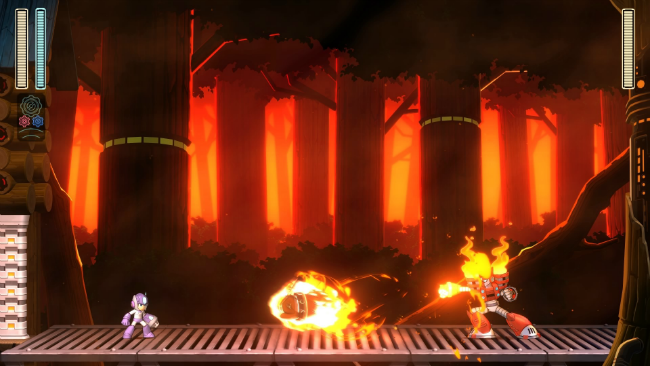 Mega Man 11 with its 2.5D-graphics looks good thanks to cute explosions, bright character models and colorful animation of the unique movements of the bosses. The levels have quite good backdrops, but in general, the graphics style of the game is too austere, especially against the background of the luxurious Hollow Knight. Control of the game is quite convenient, but sometimes a character can suddenly get stuck in a narrow passage. True it happens rarely. 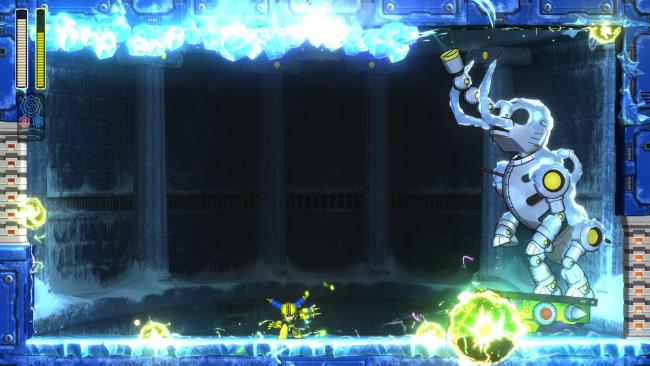 Mega Man 11 was created specifically for fans of the series. This is a good example of how you can transfer the classics to modern systems and not spoil anything. If you like challenging platformers with interesting bosses, then it is definitely worth playing. All others can pre-familiarize themselves with the free demo version.